Spring Controllers are the core concept of Spring MVC application.In this post, we will cover Spring MVC Controllers. 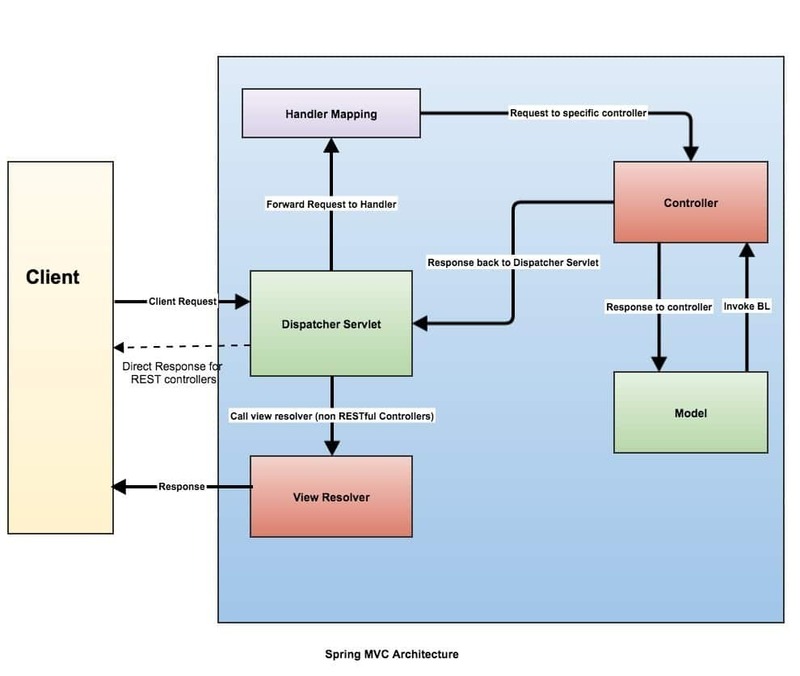 Before we start diving into the Spring controllers internals, let’s have a look at request workflow in Spring MVC application. On a high level, Spring MVC workflow move around following points. Dispatcher Servlet intercepts all incoming requests. Converts payload of the request to Spring MVC data structure. Send request to the specific controller for processing. Invoke business rule/ processing from the controller. For RESTful controllers, send the response directly to customer skipping view resolver. 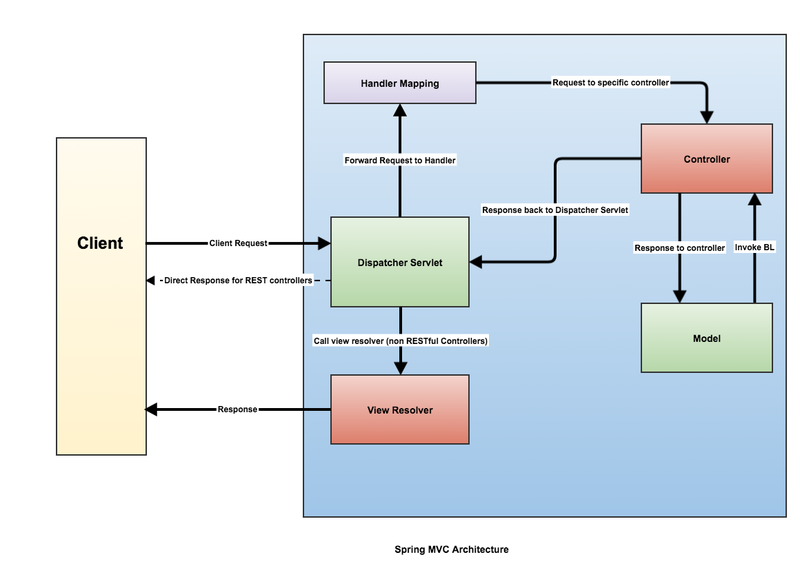 Traditional Spring MVC applications, which send the response using view resolver based on the data sent by the controller. RESTful application which returns raw data (JSON/ XML etc).This workflow does not involve any view rendering and the client will be responsible for the view. In order to add the required jar to our Spring MVC, application, we need to add spring-webmvc dependency using POM.xml file. Before we start with our application, we need to configure DispatcherServlet for our application.DispatcherServlet is a Servlet which needs setup configuration.Java configuration based registration and initialization of the DispactherServlet is the recommended way. If you are using Spring 5.x, WebMvcConfigurerAdapter class has been marked Deprecated.We can directly implement WebMvcConfigurer without the need for this adapter. The method will handle GET request. It will store a welcome message in the model. The controller will return a view which will display our welcome message. Our greeting method is annotated with @GetMapping which means this method will be called when a GET request will be sent to /greeting URI. Final information about the view will be /WEB-INF/view/greeting.jsp.Spring will try to find greeting.jsp in the /WEB-INF/view/ which will be used to display output on the frontend. If you run your application, and open following URL on the browser http://localohost:port/mvc/greeting, you should be able to see “Welcome to our sample controller” message on your browser window. In the first section, we created our controller in Spring.There were numbers of steps which were required before started working on our controller. We setup required dependencies using pom.xml. Setting up required dependencies correctly. Making sure all configurations are correct and compatible. To handle our these infrastructure tasks, Spring team has introduced Spring Boot framework. RESTful API does not require view resolver as they will send the response directly to the client. RESTful API send raw data(JSON, XML etc) to the client application. We typically use @RestController annotation for our REST controller. Read Building Restful Web Services to get more understanding about REST controllers. In this post, we covered Spring Controllers. We discussed different options to create Spring MVC Controller.